It’s also the first side-by-side with a 6-speed fully automatic DCT, a state-of-the-art beltless transmission that is durable, efficient and easy to use. Designed to excel in off-road use, the viscous air-filter element does an excellent job of providing clean air to the engine under tough conditions, with greater air flow and longer service intervals. The Pioneer 1000-5’s chassis may not be the first thing you see, but it’s one of the first things you’ll notice when you’re on the trail. The independent, long-travel suspension, excellent ground clearance and large tires all work in partnership to deliver superior ride comfort and superb traction. The rubber-mounted engine and exhaust system insulates you from annoying vibration, so your driving experience is like riding in first class, not economy. The Pioneer 1000-5's special self-leveling rear suspension automatically compensates for changing loads. This 5 seater version features 3 front seats abreast and two rear seats which can be quickly and easily folded away to make a flat bed. The Pioneer 1000-5 is loaded with features to help provide a feeling of security for the driver and passengers. The Occupant Protection Structure uses sturdy, large-diameter tubing, and includes integrated handholds, recessed top tubes and a more spacious structure to enhance protection. With a big towing capacity, tilt adjustable electric power steering and reduced noise level, the Pioneer 1000-5 gets the big jobs done more comfortably than ever before. 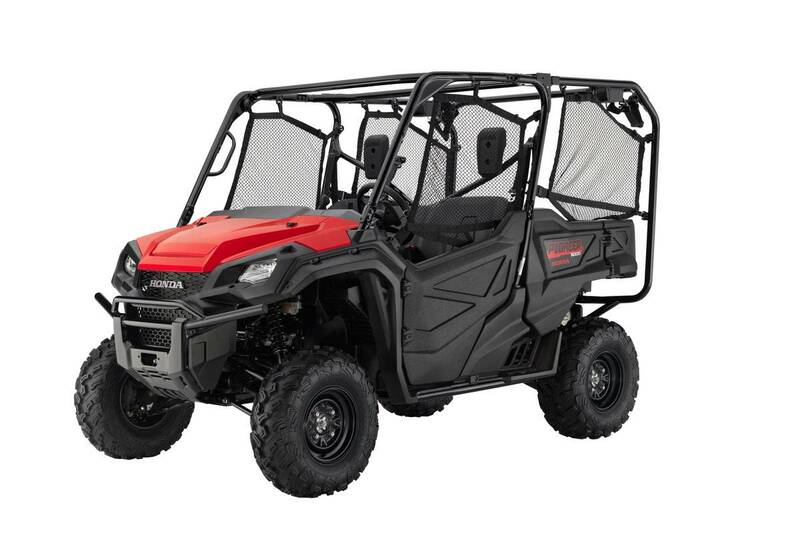 Honda is pleased to announce the introduction of the Pioneer™ 1000-3 and Pioneer™ 1000-5 into Australia, available late 2015. Honda Pioneer is recommended for drivers 16 years of age and older, and tall enough to wear the seat belt properly and reach all the controls. The passenger should also be tall enough for the seat belt to fit properly and brace themselves, if needed, by placing both feet firmly on the floor while grasping the hand hold. Please note images show overseas models and some accessories may be fitted that are not standard. All prices specified on this site are in Australian dollars and the products described and the offers made on this website are only available to residents of Australia.